“The Courage Rules” was the topic of our twitter chat on January 14, 2016 with guest host Kari Yates, author of Simple Starts. Kari is among the many others who stand tall on the mountain with me and give me the courage to push ahead and persevere. They give me the courage to shout from the mountaintop about what is right for students — what means the most to teaching and learning. Reflecting on the chat archive I realize just how fortunate I am to join together on our #G2Great mountaintop each week. If that mountaintop was not enough, I also have support from the #G2Great Voxer group that goes on practically 24/7 across multiple time zones where we share and grow ideas together. It helps to practice The Courage Rules with the strength of my friends who stand beside me each week in my professional learning network. All educators deserve a professional learning network like this one. All educators benefit from thinking in the company of others where they can lean in for learning and grow ideas through thoughtful discussions. In reflecting on this particular chat it feels like two of these rules for courage especially spoke to me this week. ust. The common thread was in creating something else with that thought. It could be either a written account or a spoken account of that reflection. Both of these approaches enable us to commit to the reflection either in the actual written word that can be reread or in a discussion with someone else, usually a PLN or colleagues in person. It is after that next step that our reflection allows us to grow and then adjust. It takes courage to reflect in the company of others or even in the written word but this is what make the learning and adjusting possible. Question #6 (Why is this rule so essential to our change efforts?) 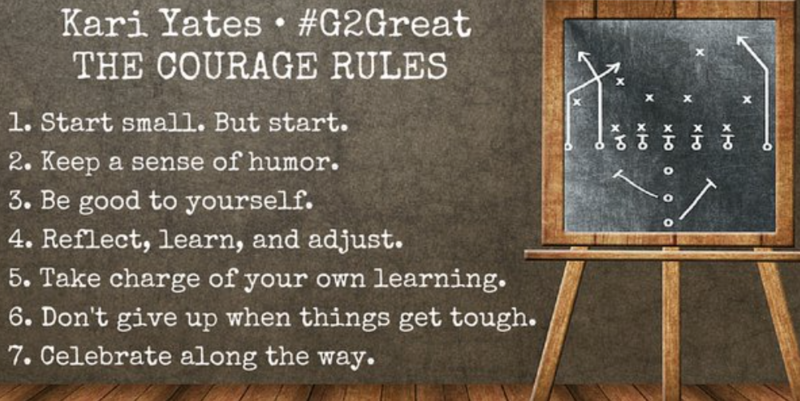 in the chat focused on rule #6, don’t give up when things get tough. Perseverance was a common word in many of the responses to this question, it feels like this is when we are just on the edge of glory. It is difficult, we want to turn back but if we just push ahead we push past that edge. It takes courage to push beyond that edge. I for one am grateful for finding my people, my tribe, my gang at #G2Great. When I am at the edge and it seems too much to bear, it is the collective learning of my PLN that helps me break through. As we stand tall on the mountain together, we can find the courage to push ahead and persevere, to shout from the mountaintop about what is right for students — what means the most to teaching and learning. Thanks for your thoughtful and eloquent post. I have been reflecting on this last chat, too. I am reminded that the power of reflection to change and grow is within us all and is necessary as we refine and extend our pedagogy. Thanks for sharing! I was in bed with the flu and know I missed a great chat. Love your closing! Yes, that is what it’s all about – and how joyous is that! I love the simplicity of all the rules, but especially “start”! Trevor said it so well in his blog post that the first step is the most important as all others follow in that first footstep!